Camping with kids isn’t impossible, even in the wilds of Padre Island. The wind peppers our dinner with fine grains of white and gold as we sit around the campfire — my husband and 2-year-old son, my mother, my stepfather and my 24-year-old cousin Jake. The experience is more one of texture than taste, and we eat quickly. “A sand dog,” Jake says, holding up the hot dog main course with an air of resigned disappointment. My son is less critical. A toddler is not a creature of ceremony, and for Theo, the lack of bathroom facilities and tableware is a bonus; the grittiness of sleeping bag and plate goes unnoticed. Though it’s his first camping trip, he settles into the adventure — a long Labor Day weekend on the beach at Padre Island National Seashore — better than any of us. The setting is very different from the beaches of my own Southeast Texas childhood, where the Gulf looks like frothy chocolate milk in contrast to Padre’s opaque blue or grayish green water. On Padre, the sand is white-colored and silky, and tiny, pastel-colored coquina clams lie open and empty at the water’s edge like frozen butterflies. Among the island’s more than 380 avian species, brown pelicans fly low in formation over the dunes, and tiny shorebirds nose in the sand, quick and comical. On my first trip here, I saw coyotes running down the beach in the foggy moonlight and, on a subsequent summer visit, I attended one of the park’s early-morning sea turtle hatchling releases. (Padre is a nesting ground of the endangered Kemp’s ridley.) On this visit, we see scores of small, still-living starfish washed up on shore, and I wonder whether we’re witnessing a seasonal die-off or if there’s some special underwater drama taking place. My mother finds an intact sand dollar that she carefully cleans and sets aside as a keepsake for Theo. This is not South Padre, the well-known, bustling resort area at the southern end of the 113-mile barrier island. 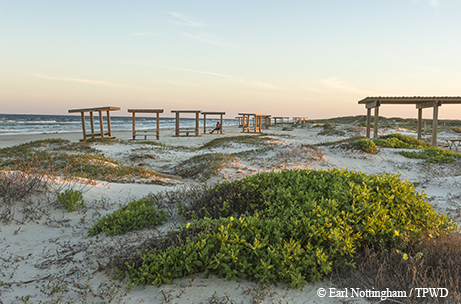 Padre Island National Seashore, accessible via Texas Highway 358 and Park Road 22 from Corpus Christi, is a 70-mile coastal wilderness where you’re more likely to encounter an egret or a kangaroo rat than a spirited spring breaker. North and South Padre are separated by a manmade channel; there’s no direct driving route between them. Since no part of the island is more than 3 miles wide and grasses make up the bulk of vegetation on inland dunes and prairies, North Padre’s landscape is always changing, dramatically reshaped by wind, water and the occasional, inevitable hurricane. It exists almost exactly as it has for ages past — empty and wild. You won’t find as long and undeveloped a stretch of beach anywhere else in the country. For me, this southern section of the Texas coast captures the passage of time — not in the familiar, metaphorical sense of the ocean’s ebb and flow, but because I have been here on several distinct adventures through the years. I see my college self, my just-married self and my current self as a mother lined up like paper dolls. How strange, I think, to have a child playing at my feet in the sand who is my own flesh and blood, and to have the woman who is applying sunscreen over the red and raccoon-like rings under his eyes — my same pattern of burning — be not only my mother but his grandmother. Even Jake, more like my little brother than a cousin, is grown up now and expecting a child of his own. Close to the Padre Island National Seashore visitor center and its facilities are 48 semi-primitive camping sites. Roughly 15 miles north on neighboring Mustang Island is the more compact Mustang Island State Park, with 48 water/electric sites and 300 drive-up sites. 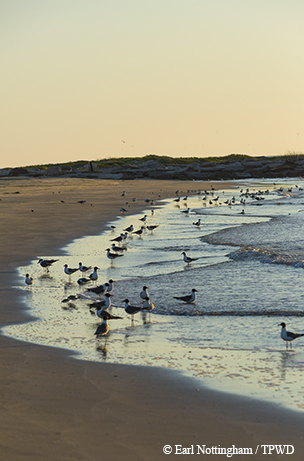 No license is required to fish along the state park’s five miles of shoreline, and it offers the benefits of hot-water showers, proximity to the town of Port Aransas and two fishing jetties. We spend some time at the state park, spotting green sea turtles swimming in the rocks just off a jetty, and we visit the national seashore’s pedestrian-only beach. Our campsite, however, is far from any amenities beyond those that Mother Nature provides or we brought in ourselves. I gave all parties involved fair warning that we’d be roughing it. We look like we’re unloading Mary Poppins’ handbag when we pitch our “primitive” camp seven miles down the national seashore’s South Beach, however, hauling out cots and tents and chairs, a shade shelter, ice chests and firewood, bags of food and towels. The first five miles of the beach are maintained for two-wheel-drive vehicles; the remainder is best explored in a high-clearance, four-wheel-drive vehicle with a full gas tank and extra supplies. On the South Beach you can set up camp anywhere you’d like as long as you’re out of the normal traffic lane and mindful of the tide line. Our nearest neighbor is at least a quarter-mile away. We spend three days swimming, walking, fishing, hunting for shells, building sand castles, flying our kite and preparing meals. Theo yo-yos back and forth to the water, a creature half-aquatic, with a rotation of adults chasing at his heels. First we seek out the sun, but soon we begin to crave the shade. On Padre, the only structures you’ll find are manmade, so some type of temporary awning is essential in the summer months. Each of us turns a unique gradation of red, as if we’ve been stuck on a spit to cook for different durations and on different sides. Dawn and dusk are the best times, when the sun has just gone to bed or is still too sleepy to rise and the sky lights up, nothing standing in the way of the show. At night we look up at the Milky Way and tell ghost stories to a soundtrack of crackling fire and breaking waves. I rarely sleep well when I camp, and each time I visit Padre there have been stars and planets to see, or an orange-colored harvest moon hanging huge and low. I don’t mind the interruptions. We sneak up on Padre’s thriving nightlife with a red headlamp. My stepfather attempts to pick up one of the large crabs half-buried at the water’s edge and, yelping, receives a sharp jab just below his thumbnail. Less intimidating are the near-transparent ghost crabs that scurry around our campsite. The tiniest I’ve ever seen perches on Theo’s diaper one morning; motionless, boy and crustacean seem to contemplate the strangeness of one another. The Laguna Madre, a unique and wildlife-rich lagoon, sits between Padre Island and the mainland; its salinity often exceeds that of seawater, which makes it the only hypersaline lagoon in North America (one of only five in the world). 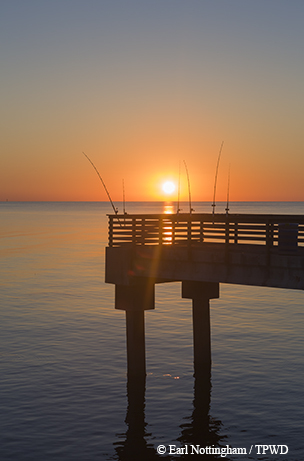 Renowned for spotted seatrout, it’s also a good place to fish for red drum and black drum, and is popular with paddlers and water sports enthusiasts. The outfitter Worldwinds Windsurfing, which rents kayaks and windsurfing equipment, is based at Bird Island Basin, just a few miles from the national seashore’s headquarters. We get Jake in the truck under the ruse of going to lunch in Port A. At first everything is going well. Jake accepts the challenge with a wry grin as I put the paddle in his hand, and though it’s perilously close to his naptime, Theo is happily “helping” me paddle in the bow of the double kayak, watching Gran and Poppa and Uncle Jake paddle away from us in singles. But there’s a stiff headwind, and the scenery doesn’t change. When Theo figures out the water is only a few feet deep he starts throwing himself overboard. I find myself jealous of the group doing an introductory windsurfing lesson — which under the circumstances seems both more and less ambitious. Finally I eat crow and say we should walk the boats back in, having made it 100 meters or so from the shore. Jake and Poppa are happy enough to head into town to buy bait and eat fried chicken without sand in it. Waiting until we’re all back at camp to rub saltwater in my wounds, Jake says that he and Theo share the same feelings about boats with no motors. As you get older and move away from home, you start spending less time with your family. I’d forgotten how easygoing they were, how it’s “whatever you want” or “whatever you’d like to do.” They’ll give you the best of something rather than take it themselves. They’ll drive seven hours from East Texas to meet up with you and camp in the sand. That said, they will complain — oh, songs will be sung about this latest adventure — but it will be good-natured, at least. My son is lucky to have these people in his life. As lucky as me. I don’t know how many times I’ve stared out at the horizon, longing to be somewhere else. When I read the book Kon Tiki by Thor Heyerdahl as a kid, I wanted desperately to see the bioluminescent plankton he wrote about. In travels since to many different coastlines in many different countries, I never had, but on our last night of camping I’m knee-deep in Padre’s surf, running my fingers through the water, when I see a faint sparkle of light. Before I go back to camp and get the others, I take a moment to laugh at myself — all of my paper-doll selves, through the years. In the darkness there is no distant horizon to dream about, nothing but the water and the sand and the subtle glow of these tiny, timeless creatures. I’ve finally found them, as I have so many other things I’ve sought, very close to home.